FILE - U.S. President Donald Trump gestures as he speaks during a news conference in the Rose Garden at the White House in Washington, Sept. 26, 2017. President Donald Trump said Monday that U.S. attempts to deal with North Korea have failed for more than two decades. "Our country has been unsuccessfully dealing with North Korea for 25 years, giving billions of dollars & getting nothing. Policy didn't work!" Trump said in a Twitter comment. Trump's new remarks were his latest hint that he could upend long-standing U.S. policy aimed at containing North Korea's nuclear weapons development, short of confrontation. Trump wrote Saturday that past U.S. presidents talked to North Korea with "agreements made and massive amounts of money paid ... hasn't worked, agreements violated before the ink was dry, making fools of U.S. negotiators. Sorry, but only one thing will work!" It was not clear exactly what Trump meant by "one thing." However, the comments may suggest that he was referring to military action as he said Secretary of State Rex Tillerson is "wasting his time" trying to talk to the North. Trump has engaged in weeks of taunts with North Korean leader Kim Jong Un, saying the United States would "totally destroy" North Korea if necessary to protect itself and its allies if Pyongyang attacks. North Korea has conducted numerous missile and nuclear tests, including launching rockets over Japan. Pyongyang's state media quoted Kim as telling the powerful Central Committee of the ruling Workers' Party over the weekend that North Korea's nuclear weapons program is a "treasured sword" to protect it against aggression. Kim said the nuclear warheads were a "powerful deterrent" guaranteeing the country's sovereignty against what he described as "protracted nuclear threats of the U.S. imperialists." 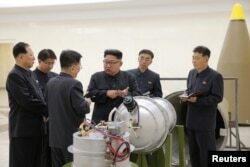 FILE - North Korean leader Kim Jong Un, center, is said to provide guidance on nuclear weapons development in this undated photo released by North Korea's Korean Central News Agency in Pyongyang, Sept. 3, 2017. But he acknowledged that North Korea's standoff with the United States, Japan, South Korea and other countries over its nuclear weapons development was a "complicated international situation." The Kremlin says Russian Foreign Minister Sergei Lavrov warned U.S. Secretary Tilllerson in a telephone call Monday against what it says is U.S. increase of tensions in Korea. A ministry statement says Lavrov "stressed the unacceptability of an escalation of tensions on the Korean peninsula which the American military preparations are leading to." The ministry says Lavrov believes diplomacy is the only option. Trump's threats drew the ire Sunday of one key U.S. lawmaker, Senator Bob Corker, chairman of the Senate Foreign Relations Committee, who engaged in an exchange of barbed Twitter comments with the president. Corker told The New York Times that he sees Trump as treating his role as the U.S. leader like a reality television show with threats toward other countries that could put the United States "on the path to World War Three." "I don't think he appreciates that when the president of the United States speaks and says the things that he does, the impact that it has around the world, especially in the region that he's addressing," Corker said. Trump, in an earlier tweet, said Corker, who has announced his retirement, effective in early 2019, did not have the "guts" to run for re-election in 2018 for a third six-year term in the Senate. Corker quickly responded, "It's a shame the White House has become an adult day care center. Someone obviously missed their shift this morning," he said on Twitter. VOA's Kenneth Schwartz contributed to this report.